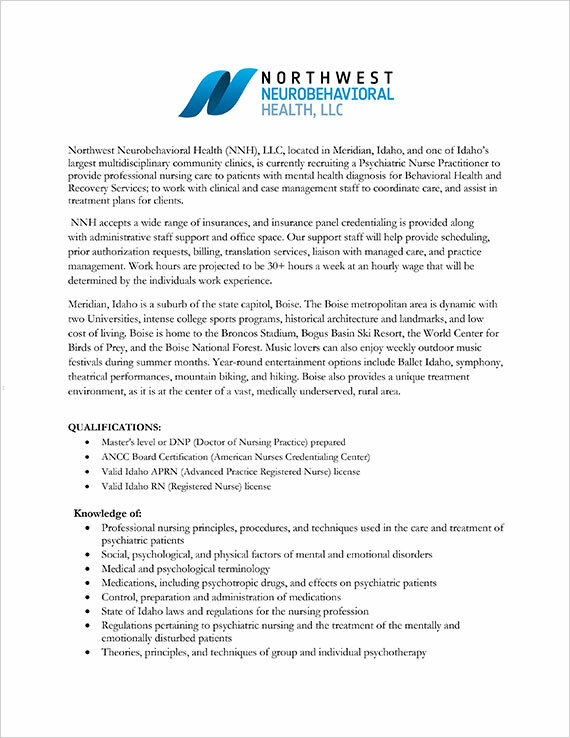 Northwest Neurobehavioral Health (NNH), LLC, located in Meridian, Idaho, and one of Idaho’s largest multidisciplinary community clinics, is currently recruiting a Psychiatric Nurse Practitioner to provide professional nursing care to patients with mental health diagnosis for Behavioral Health and Recovery Services; to work with clinical and case management staff to coordinate care, and assist in treatment plans for clients. NNH accepts a wide range of insurances, and insurance panel credentialing is provided along with administrative staff support and office space. Our support staff will help provide scheduling, prior authorization requests, billing, translation services, liaison with managed care, and practice management. Work hours are projected to be 30+ hours a week at an hourly wage that will be determined by the individuals work experience. Meridian, Idaho is a suburb of the state capitol, Boise. The Boise metropolitan area is dynamic with two Universities, intense college sports programs, historical architecture and landmarks, and low cost of living. Boise is home to the Broncos Stadium, Bogus Basin Ski Resort, the World Center for Birds of Prey, and the Boise National Forest. Music lovers can also enjoy weekly outdoor music festivals during summer months. Year-round entertainment options include Ballet Idaho, symphony, theatrical performances, mountain biking, and hiking. Boise also provides a unique treatment environment, as it is at the center of a vast, medically underserved, rural area.